Ukrainian (Kyiv) Icon, Theotokos as Sophia, the Holy Wisdom, 1812. 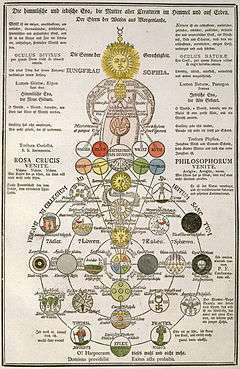 Sophiology (from Greek Σοφία "sophia", wisdom) is a philosophical concept regarding wisdom, as well as a theological concept regarding the wisdom of God. Sophiology has roots in Hellenistic tradition and Platonism. Sophia had a major role in almost every sect of Gnostic Christianity. In the Orthodox Church, sophiology is often regarded as equivalent to sophianism, which has been condemned as heretical by the Patriarch of Moscow and other Orthodox hierarchs, who decided to "...recognize the teaching of Archpriest Sergei Bulgakov on Sophia the Wisdom of God as heretical". Personified representations of Holy Wisdom (Ἁγία Σοφία) or the "Wisdom of God" refer in Orthodox theology to the person of Jesus Christ, as illustrated in the Acts of the Seventh Ecumenical Council (Nicaea II, 787): "Our Lord Jesus Christ, our true God, the self-existent Wisdom of God the Father, Who manifested Himself in the flesh, and by His great and divine dispensation (lit. economy) freed us from the snares of idolatry, clothing Himself in our nature, restored it through the cooperation of the Spirit, Who shares His mind..." More recently it has been stated that, "From the most ancient times and onwards many Orthodox countries have been consecrating churches to the Lord Jesus Christ as the Wisdom of God." There exist Orthodox Christian icons and churches which bear the name "Saint Sophia" (see Hagia Sophia (disambiguation)), but this is typically not in reference to a specific individual, saint or angel, named "Sophia". Often it is a mistaken translation of Ἁγία Σοφία, properly rendered "Holy Wisdom", a Christological title used in the Orthodox Tradition. A mystical depiction of Sophia from Geheime Figuren der Rosenkreuzer, Altona, 1785.